Newburg presented us with an opening to enjoy a beautiful afternoon and tdaste some wines from Chehalem, Bergstrom and Penner-Ash, familiar only by reputation and to, inadvertently, discover the best BLT of my life. Oregon is primarily known for high quality pinot noir and pinot gris, and I am always astounded by the depth palate of wines produced there. 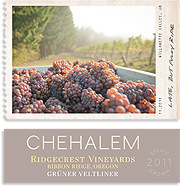 A prime example is Chehalem, showcasing 10 new releases from five varietals at their downtown tasting room. Our first tasting is from an uncommon varietal, though it’s the most widely planted in Austria, named Gruner Veltliner. Covering more than 50,000 acres of vineyards, Gruner Veltliner has transformed itself from Austria’s commercial grape to a low-yield powerhouse over the past 25-30 years. Winemakers discovered, decades ago, with low-yield methods and mature fruit, the potential of this varietal to produce highly concentrated wines with deep aromas and flavors. 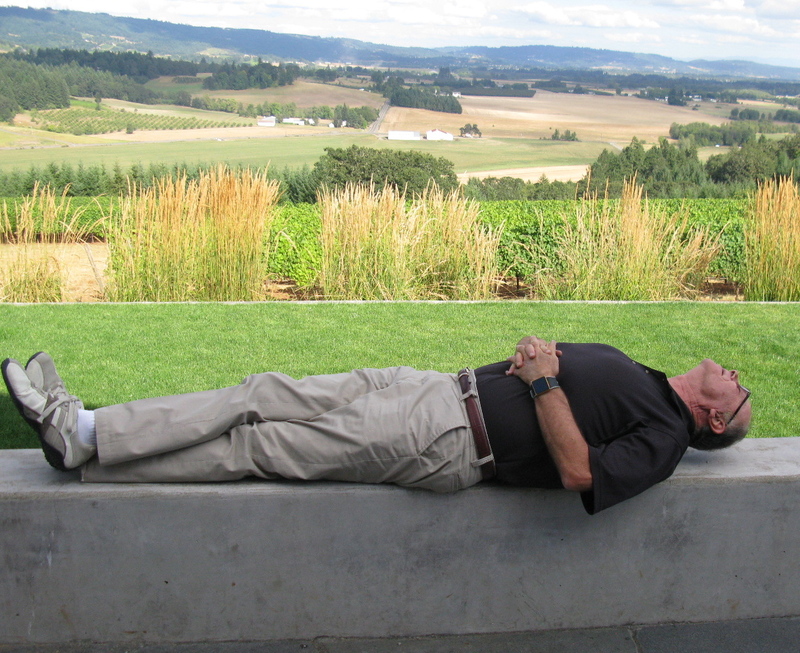 While in Oregon, I always sample the pinot gris, arguably the best in the world. The 2011 Chehalem “3 Vineyards” Pinot Gris ($19) is very nice if you like soft floral aromas, flavors of ripening fruit and unusually long finishes that seem to go on forever. A nice finish was also present with the 2010 Chehalem “Reserve” Dry Riesling ($24), a bone-dry wine that, in my view, expressed extraordinary complexity. The final and, certainly, their flagship white wine was the 2009 Chehalem Ian’s Reserve Chardonnay ($36) from Stollar Vineyard, awarded 91 pts. from Wine Spectator magazine. This vintage, which the winery says may be its best, delivers “comfort” spices and orchard fruit in both the bouquet and flavor, expressing a rich “baked” texture throughout. Aged seven months in 35% new oak barrels, this wine has the depth to last awhile. 2009 Chehalem Ian’s delivers “comfort” spices and orchard fruit in both the bouquet and flavor, expressing a rich, “baked” texture throughout. Aged seven months in 35% new oak barrels, this wine has the depth to last awhile. hints of wild blackberries that grow nearby. 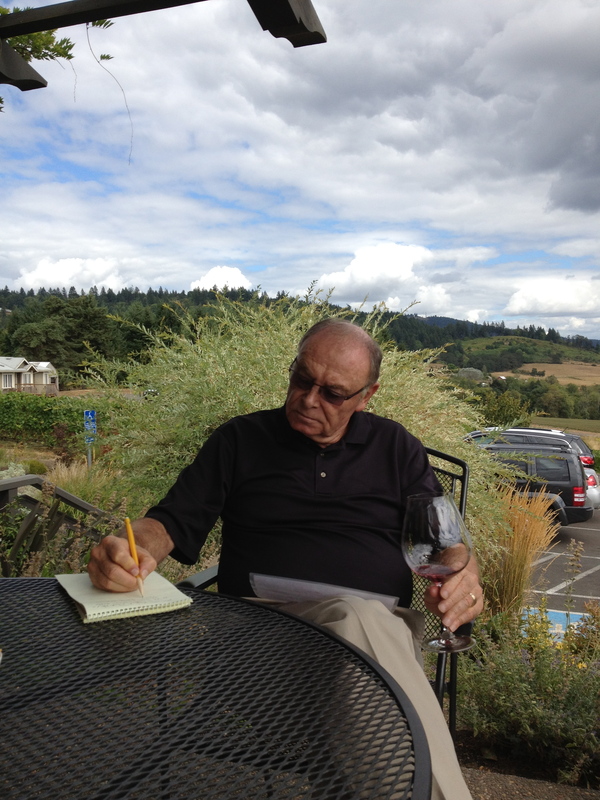 From time to time, Bergstrom Wines are featured in periodical reviews of Oregon pinot noir wines. Started by Dr. John and Karen Bergstrom as a family business, operations are now run by son Josh and his wife Caroline. Above picturesque vineyards, the relaxed outdoor porch provides to environment to appreciate the quality of their wines, from whole-cluster rose’ to the single-vineyard pinot noir, all exceeding my expectations. With a view of the barn and de Lanceotti Vineyard, we began with a 2011 Bergstrom Rose’ Pinot Noir, a well perfumed wine with hints of peaches and strawberries, nice as an apéritif, but with the structure to pair with food. In 2009, the San Francisco Chronicle named the 2008 Bergstrom “Old Stones” Chardonnay among their Top 100 wines. A crisp Burgundian-style with healthy mineral notes, the 2010 Bergstrom “Old Stones” Chardonnay ($30) maintained nice flavors of white peach and pear, a perfect match for lobster, crab or BBQ oysters. It also has the structure to age a few years. Bergstrom “Cumberland Reserve” Pinot Noir ($42), from multiple vineyards, is a deep ruby color with complex flavors of dark chocolate, black cherry and dark raspberry. Awarded 92 pts. from Robert Parker, it has the tannins to expand its depth over time. Earning ratings of 92-93 pts from Wine Spectator and Robert Parker, the 2010 Bergstrom “de Lancellotti Vineyard” Pinot Noir ($65),my personal favorite, epitomizes full-bodied high-end pinot noir with smokey, floral and perfume traces on the nose and deeply concentrated “cherry pie” textures throughout the finish. Just when we thought things could not get better, we were pleasantly surprised with two special tastings, not on the menu. 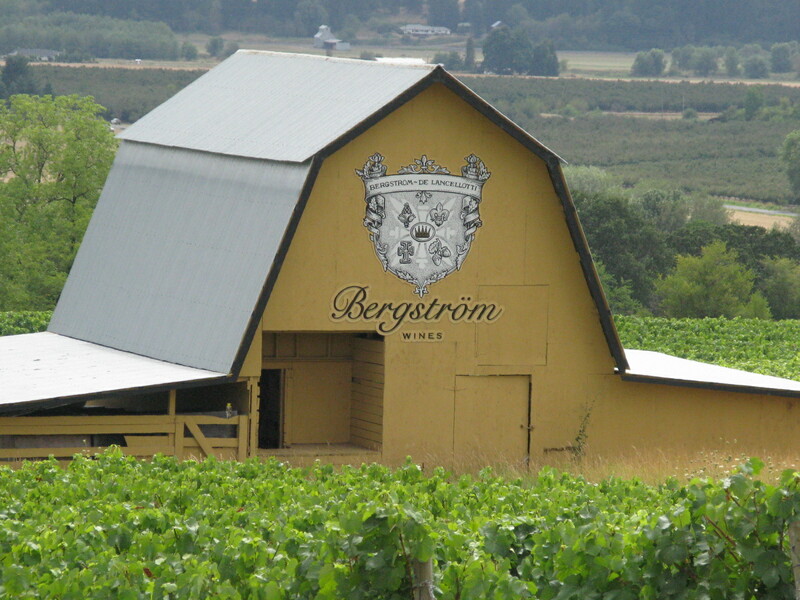 The 2010 Bergstrom “Bergstrom Vineyard” Pinot Noir ($80) has all the qualities of a classic pinot, but on steroids. Rich and opulent aromas and flavors merited ratings of 93-95 pts from the experts. Finally, we felt honored when offered a taste of the equally opulent 2010 Bergstrom “Winery Block” Pinot Noir ($150) from a small 1.5 ac vineyard of special low-yield vines, attracting a limited market of collector’s. It captured intensity and boldly concentrated fruit. 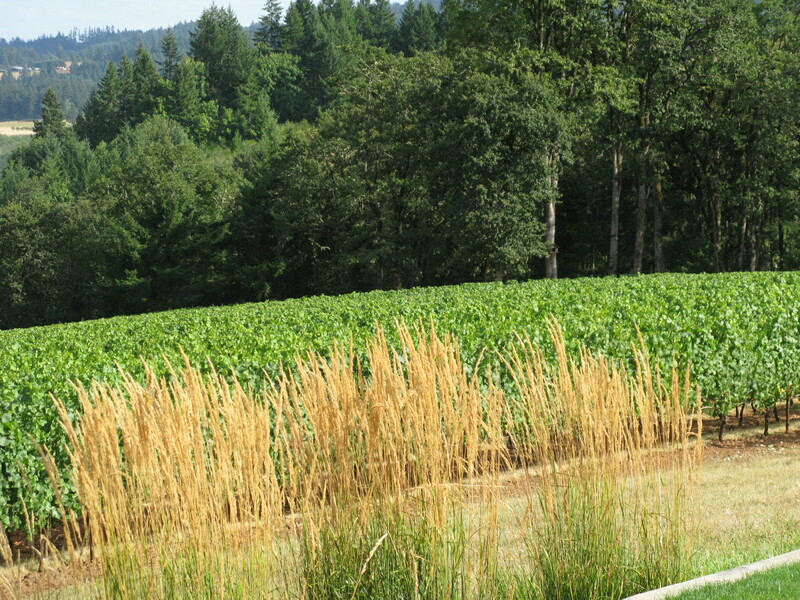 Bergstrom is a special experience and a highly recommended stop in the northern Willamette Valley. With 10 years experience as winemaker and President at Rex Hill Winery, Linda Penner Ash, along with husband Ron began Penner-Ash in 1998 with the spirit to continue the tradition of small production pinot noir in the north Willamette region. Their property is as picturesque as any in the area with a sustainable three-level gravity winery and tasting room that is architectural impressive and unique. Our first tasting, the 2010 Penner-Ash Viognier ($30), sourced from vineyards in southern Oregon comes from 100% stainless steel fermentation but still has a rich velvety feel and soft peach flavors. The pinot noir grape adds a unique flavor profile to a rose’ and the 2011 Penner-Ash “Roseo” ($19) is no exception. Nice spice and dark fruit flavors with tart cranberry throughout the finish. We tasted two contrasting pinot noir wines, one comprised of grapes from 18 vineyards in six AVA’s with production of 5,700 cases and the other yielding 575 cases from a single-vineyard. The 2010 Penner-Ash Willamette Valley Pinot Noir ($45), with its diversity, still delivers classic pinot noir elegance with typical spices and cherries extending through an earthy finish. That same complexity delivered delivered within a soft, velvety texture describes the 2010 Penner-Ash “Dussin Estate Vineyard” Pinot Noir ($60). Pinots this heavy-on-the-tongue often hints of chocolate, as is the case here. 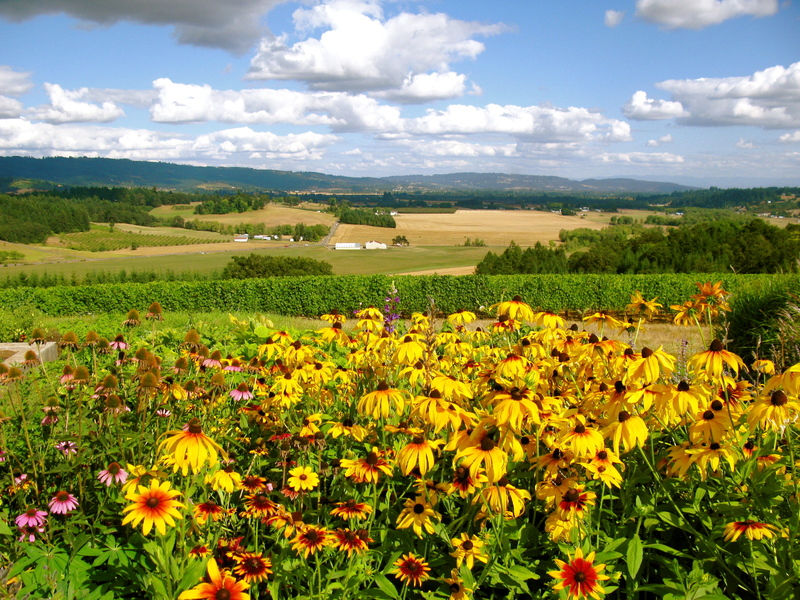 The Dussin and other Penner-Ash vineyards are certified to preserve resources in the wine industry and designated “salmon-safe”, using farming practices that protect local watershed areas. reason, I was attracted to the 2009 Penner-Ash Oregon Syrah ($32), complex flavors with soft vanilla spice, aged 17 months in 40% new French oak, plus 2% viognier and a nice finish with the tannins in balance. There was a mid-day stop at Recipe, a restaurant gaining praise throughout the region for its fresh, seasonally adapted menu. I opted for the daily special “Heirloom Tomato BLT” sandwich that, although it had the same ingredients as all the others, was prepared with fresh heirloom tomatoes, some added avocado, on freshly baked bread with a light, creamy sauce. This is a sandwich to remember. Newburg is a happening place. The weather, at least the last two weeks of August, is great, the landscape is stunning with conscientious vineyards and endless vistas, resulting in wines that deserve to be as good as they are. This entry was posted on Monday, October 15th, 2012 at 7:30 pm	and posted in Wine. You can follow any responses to this entry through the RSS 2.0 feed.